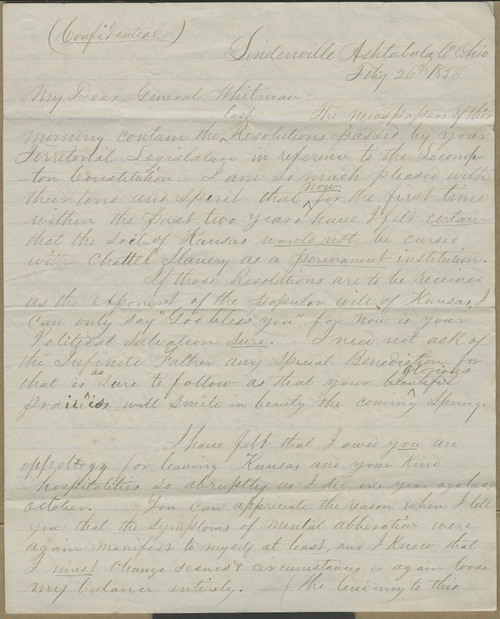 To his Kansas friend "General Whitman," John Brown Jr. wrote from his farm in Ashtabula, Ohio, regarding his continued commitment to the cause of Kansas and the state of his health. Brown wanted Whitman to know the reason for his sudden departure in October 1856: "the symptoms of mental abberation were again manifest to myself at least, and I knew that I must change scenes & circumstances, or again loose my balance entirely." But despite the hardships endured and the resulting illness, "Kansas is deguerotyped upon my heart, a stormy yet glorious picture."